There are several interpretations of the Butterfly pattern structure. Unlike the Gartley pattern, the Butterfly pattern offers the possibility to enter long/short at new lows/highs. It’s because wave D of the pattern extends beyond the starting point of wave XA. 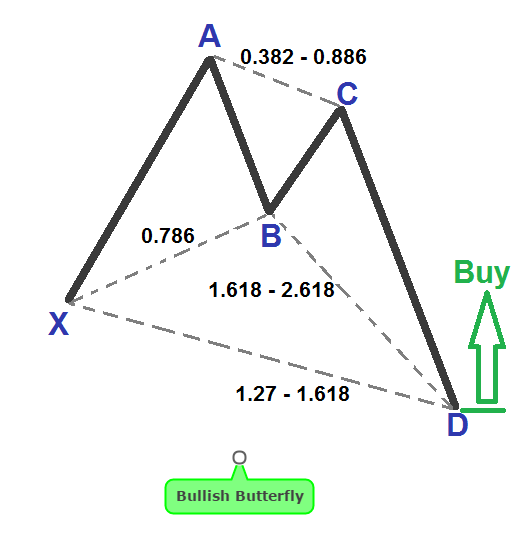 The Butterfly pattern depends upon the B point as it defines the pattern’s structure and sets up the other measurements within the pattern to define the trade opportunities. For all harmonic trading strategies and trading in general precision is the key because we eliminate mistakes when we’re as precise as possible. 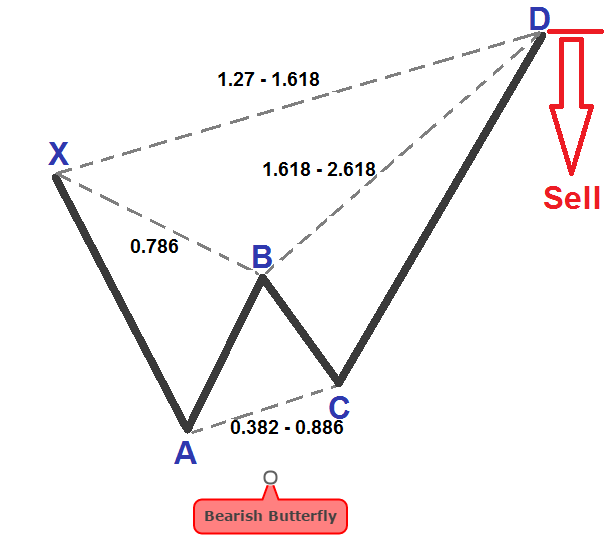 The character of the Butterfly pattern is that it’s not a severe pattern, it’s more about a corrective structure that usually defines important swing low and high prices. The Butterfly pattern must include an equivalent AB=CD pattern, it’s a minimum requirement, however, the alternate 1.27AB=CD is more common for this structure. AB= 0.786 or 78.6% retracement of the XA swing leg. BC= minimum 38.2% – maximum 88.6% of AB swing leg. CD= minimum 1.618 – maximum 2.618 of AB swing leg. CD=minimum 1.272% – maximum 1.618% of XA swing leg. The 1.27XA projection is the most critical number in the potential reversal zones. And, finally, the C point must be within the range of 0.382-0.886 retracement. This essentially ensures that this “M” or “W” type extension structure possesses the correct structure alignment to define the trading opportunity. The B point of the Butterfly pattern must possess precise 78.6% retracement of the XA leg. The optimal entry point for our trades is at 1.618 extensions of AB swing leg using a protective stop loss 10 pips above/below the 2.618 extensions. The optimal target for the Butterfly pattern is the 61.8% Fibonacci retracement of CD leg. However, it’s recommended to scale back your position and take partial profits once we hit 38.2% Fibonacci retracement. In the examples below, I’m gonna use our own proprietary Harmonic Dashboard indicator that does all the hard work for you and identifies valid Butterfly patterns that follow the correct Fibonacci ratios. In the example below, we have a perfect bearish Butterfly pattern with the swing wave CD terminating slightly above the 1.618 extensions of XA. Also, wave BC doesn’t exceed the 88.6% of AB, but wave AB falls short of reaching the 78.6% retracement of XA which as stated in the beginning of the article is very important for defining the structure of the Butterfly pattern. However, our optimal target of 61.8%Fibonacci retracement of the CD has been missed as the price only slightly broke below the 38.2% were ideally we should have begun scaling back from our position. In this example, we can notice how wave AB retraced at least 78.6% of XA leg meeting the minimum Fibonacci ratio requirements and subsequently has lead to a higher probability trade. The Butterfly pattern, like all of the other harmonic patterns, is giving you the opportunity to participate in a move right from the start, therefore, it means that you can have a very good risk to reward ratio.